How would I cope with being down on my luck, without a good job, a nice house to come home to in the evening, and so many other parts of daily life we so often take for granted? I imagine I might be depressed and anxious. I might have difficulty coping with my situation, and that would only make it all the more difficult to get back on my feet again. Maybe, I’d recognize my need for help, but not be able to get to it due to lack of insurance, lack of transportation, and uncertainty about what each day would bring. Unfortunately, these are the situations that too many homeless people have to grapple with and too few of those of us who currently have housing think about. One of CHC’s most important programs is “Wherever You Are” which provides special care for people who do not have stable housing situations. Our providers visit the homeless in shelters around Connecticut. Today, Martha Trevey, an APRN who works with the WYA program was seeing a patient in Meriden with an urgent need of a psychiatry appointment. The patient had no insurance and no means to get to a psychiatrist’s office. 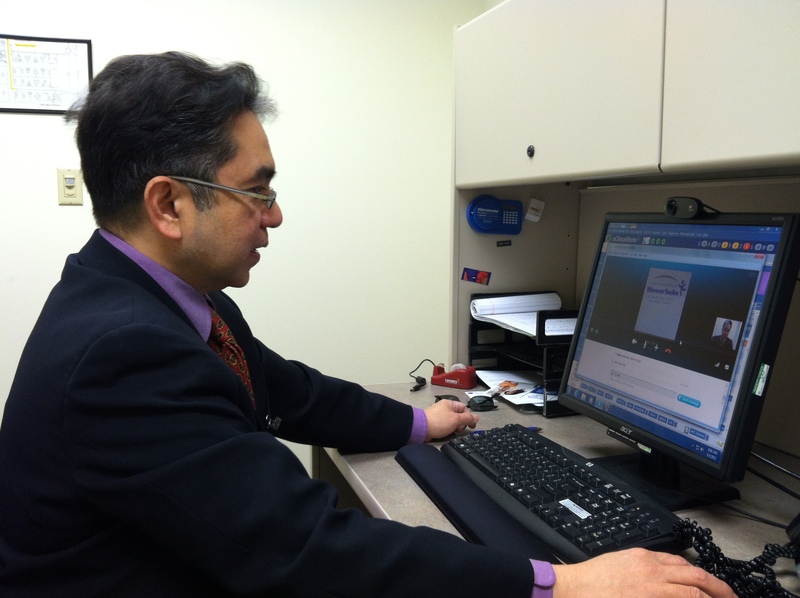 So, Martha set up an appointment over Skype with Dr. Lorenzo, a psychiatrist that works for CHC in our New Britain office. Dr. Lorenzo, after speaking with the patient, sent in a prescription electronically and a follow-up appointment was scheduled for two weeks. The patient, who had never used a video-conference before said it felt a little weird, but that he liked the doctor and wanted to continue having appointments this way while he didn’t have insurance. There are plenty of issues that this raises. Some therapists I know question whether you can provide adequate services via a video-conference, yet a friend of mine who helped set up one of the first crisis hotlines over telephones decades ago noted that the same criticism was leveled against telephone hotlines back then. Now, such crisis intervention hotlines are ubiquitous. Then, there is the issue of how such services get paid for. The patient seen at the shelter didn’t have insurance. Yet if the patient was covered by insurance, in most cases, it would not be billable since telemedicine is not billable in Connecticut and in many states. Now, more and more states are considering legislation that would make services provided via telemedicine billable. CHC continues to innovate and establish best practices and the recent psychiatry appointment for the patient without insurance or stable housing provides a good example. Hopefully, this will help the patient cope with a difficult situation and get back on his feet more quickly. Hopefully, it will also provide useful data about how to make telemedicine a successful part of a practice; data that will help legislators consider the best way to fund these types of services.